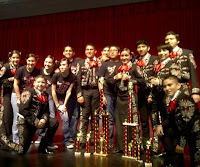 The VMS Mariachi has done it again! Mariachi Juvenil de America competed on Saturday, March 5, 2010 at the 5th Annual Mariachi Festival in Roma, Texas. The VMS Mariachi was awarded “Best” in all individual sections as Best Trumpets, Best Violins, Best Rhythm, Best Vocals and also earned the 1st place award in the middle school category. The highlight of the competition was that the VMS Mariachi made history, for the second time this year, by earning the Overall Best Mariachi Trophy and beating out all the middle school and high school mariachi groups at this competition! They competed against 17 middle school and high school mariachi groups that represented schools from San Antonio, Corpus Christi, and the Rio Grande Valley. These students continue to shine with their talent and make Veterans Middle School and their community extremely proud. Their dedication, determination, and commitment have truly paid off for the VMS Mariachi students, their director, and their school! Mariachi Juvenil de America and their director would like to extend their thanks and appreciation to their VMS Principal, Mr. Joel Trigo, Jr., their school, community, and the proud parents for all their support. The VMS Mariachi will now be preparing for their second competition of the semester was held on April 2nd at the UTPA Fine Arts Auditorium in Edinburg, TX at 11:00 a.m. Congratulations to the VMS Mariachi students and their director, Mr. Eloy Garza. Keep up the fantastic work!